Fresh off of a Pac-12 South title run, the Arizona Wildcats find themselves in an unprecedented run of success, much like their in-state rival. The Wildcats have also brought back plenty of the pieces they need to contend for another division title this season, but it won’t be easy. Nothing is ever easy in this division. However, the ‘Cats have one big difference maker on defense in Scooby Wright, and my prediction for the Arizona season is that their win total is directly proportional to the number of “Scooby Snacks” consumed. Thousand yard receiver Cayleb Jones returns to lead one of the best receiver groups in the conference. The other big returning playmaker is Samajie Grant, the slot receiver, who caught 45 passes for 718 yards. Trey Griffey also plays receiver for the ‘Cats, and yes that is Trey Griffey as in Ken Griffey III. (This easily makes Arizona one of my personal favorites for the season because Ken Griffey, Jr. was my favorite baseball player growing up). Anu Solomon put up remarkable stats as a freshman last season, and he should only get better as he progresses as a quarterback. His 58% completion percentage could stand to improve some, but 3,793 yards and a 28:9 TD-to-INT ratio is very good for a freshman. One thing he also needs to improve going forward is he tended to rely on the running game to open up his passing game. 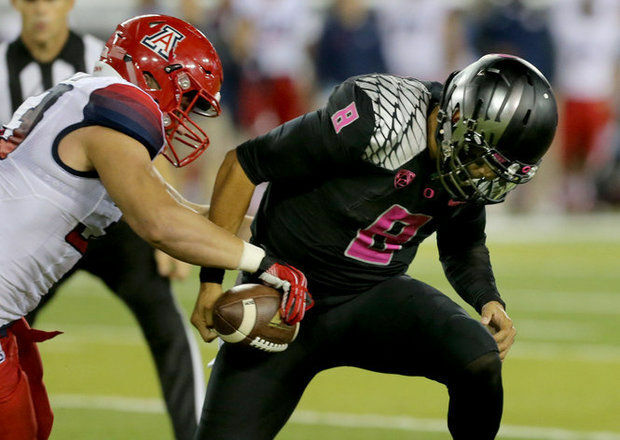 When Arizona couldn’t run the ball last season, the whole offense sputtered. As Solomon gets older, he needs to learn how to get the offense going even when the running game is having a tough go of things. Nick Wilson, another sophomore, is another player who should build on a stellar freshman campaign. Granted, there may not be much room for growth as Wilson rushed for 1,375 yards and sixteen touchdowns last season. If he improves on that then he will be in the NFL before too much longer. Solomon also provides a viable running threat, especially in the Spread Option game, as he topped 500 yards on non-sack carries last season. Guards Cayman Bundage and Jacob Alsadek return from last season’s line, but they will both be flanked on either side by a new starter in 2015. The other three anticipated starters on the line are all journeymen in some form or fashion. Zach Hemmila is the guy I expect to end up starting at center after being recruited and starting his career as a left guard. Cal transfer Freddie Tagaloa will start at left tackle, and at right tackle Lene Maiava will finally settle in after moving all over the line in his college career. Scooby Wright is an absolute animal at linebacker for this team, and is the single biggest difference maker on the whole team. 131 tackles, 29 tackles for loss, 14 sacks and six forced fumbles would be decent stats for a whole starting group at linebacker, but that’s what Wright did by himself last season. It’s safe to say that Scooby has already significantly outperformed his two-star high school rating. He will be terrorizing NFL offenses in 2016. Scooby may not have left many tackles out there for his running mates at linebacker, but both of the other starters return as well and Cody Ippolito and Derrick Turituri put up a respectable 70.5 tackles, 11.5 tackles for loss and four sacks combined. Will Parks is the biggest playmaker left in the secondary, and likely the number two playmaker on the whole defense. He actually had a very productive season as a “backup” in 2014 with over 60 tackles, 13 tackles for loss, two interceptions and eight passes broken up. He has also been named a captain for the season opener. A pair of sophomores are expected to start at corner in Jarvis McCall, Jr. and Cam Denson. McCall had 40.5 tackles last season and broke up seven passes, and Denson had two picks in his freshman campaign. The line is easily the unit on this defense that has the least returning production. Some of that may be due to the linebacking corps and secondary stealing their thunder, but it also seems like there are opportunities for this group to take a step forward. Reggie Gilbert is the leader of the group. He recorded 40 tackles and three sacks last season. No other member of the line topped fifteen tackles or one sack. 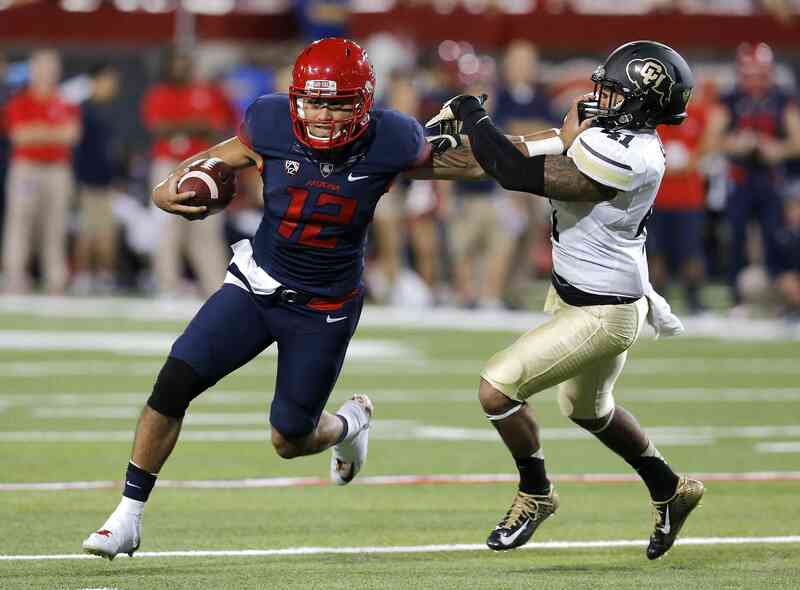 Arizona did a remarkable job in taking the division last season, but it remains to be seen whether or not the two-game slide to end the season will effect the ‘Cats heading into this season. Fortunately, the early season schedule should provide ample time for the Wildcats to work through some growing pains if need be with their first three games against UTSA, Nevada and FCS Northern Arizona. Nevada won’t be an easy game necessarily, but the other two should be. 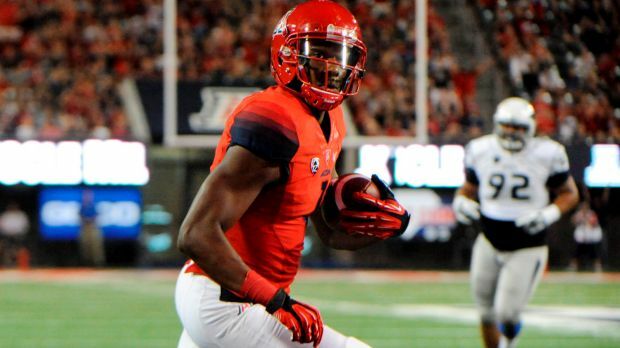 But then September closes with a bang as Arizona hosts UCLA in their conference opener. The Wildcats were 6-2 in one possession games last season and probability says that that isn’t replicable. I’ll, in true formulaic and mathematic form, say they go roughly .500 in similar situations this year and go a perfectly respectable 8-4.
a few pals ans addijtionally sharing in delicious.